The toxic herbicide whose destructive capabilities I’ve just described is known as atrazine, and it is widely sprayed by our state’s timber industry. We also shouldn’t hesitate calling glyphosate or 2,4-D toxic herbicides. Glyphosate (the main ingredient in Roundup) is known to pollute waterways, strip soils of vital nutrients, and is in the process of being banned by California and the EU. It was also declared “probably carcinogenic to humans” by the World Health Organization in 2015. 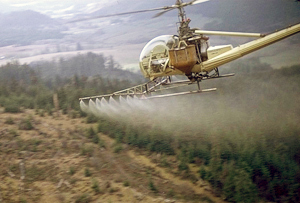 Then there’s 2,4-D, best known as half of the infamous Agent Orange defoliant used during the Vietnam War as part of our country’s herbicidal warfare program. 2,4-D is commonly sprayed in forestry and food production settings, and has been linked to endocrine disruption, thyroid disorders, birth defects and cancer. As nasty as all these chemicals are, their potency is magnified to an unknown degree when timber companies add them to a toxic witches’ brew that includes lesser-studied herbicides and spray additives such as surfactants, compatibility and buffering agents, antifoam and drift control agents, crop oil concentrates, nitrogen fertilizers, spreader-stickers, wetting agents, penetrators . . . you get the idea. So, if science has already demonstrated the hazards of many of these chemicals, then why do companies like Weyerhaeuser continue to spray them over vast swaths of local timberland on a routine basis? A short answer is because it’s still legal. Another is because spraying these chemicals is a profitable compliment to modern industrial forestry. Those already familiar with the production of GMO corn and soy will intuit the broader strategy. For decades, timber companies have been “genetically improving” Douglas fir seedlings to make them resistant to the onslaught of these chemicals. Vegetation less profitable to the timber companies are destroyed, and the industry’s “plus-trees” can grow more quickly without as much competition for water and sunlight. If this were merely a contest between corporate profit margins and silvicultural purity, then it could easily be dismissed as a fringe issue. However, a growing coalition of hunters, conservationists, outdoor enthusiasts, and regular small-town folks are questioning the wisdom of contaminating their backyards, waterways, and recreational areas for the sake of growing inferior firs at breakneck speed to benefit stockholders. Many locals point to the precipitous decline of our local fish and wildlife populations as a sign that our forests are being poisoned, while a substantial body of evidence suggests that herbicides are contributing to a mysterious hoof disease which continues to decimate elk herds throughout the Pacific Northwest. And tragically, our rural communities are rife with sickness and cancer. Make no mistake, these are our forests we’re talking about. Water, wildlife, and even some of these sprays don’t obey property lines. A toxic siege is upon us. Will we fight back?